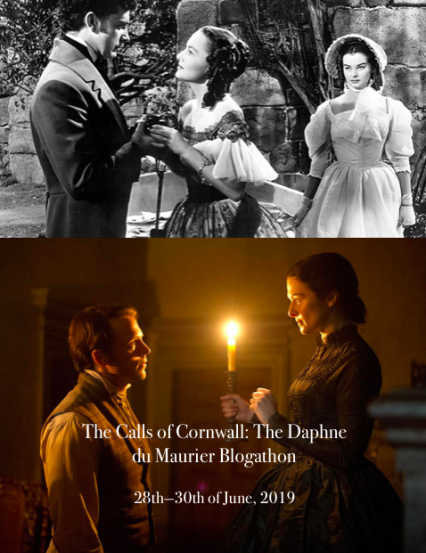 I've been promising a fellow blogger, Rachel (Hamlette), for months that I was going to get around to doing this double feature, but I kept putting it off, due to time and commitments to various blogathons. She is a big Alan Ladd fan, and, I might add, a fellow enthusiast for film noir, of which both of these movies are under that double umbrella. I, too, am a big fan of film noir. 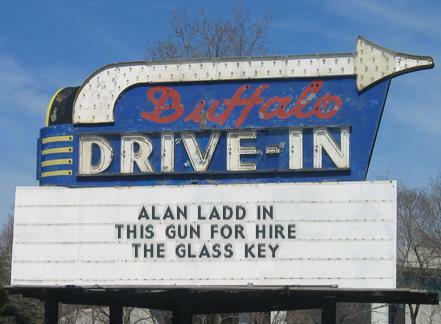 Personally, however, I can take or leave Alan Ladd. I've seen a number of movies he was in, and he is a great actor, but as I've stated before, with the exception of John Wayne, I don't actively seek out movies just because a certain actor or actress is in it. (Of course, the opposite is not true... 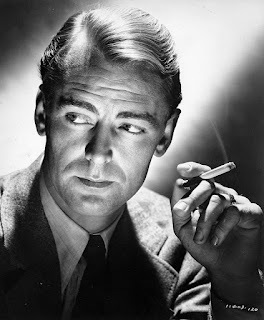 I have also stated elsewhere that I dislike Kevin Costner and Tom Cruise, and it would take an extraordinary movie indeed for me to sit through one with either of those two guys...) But Alan Ladd is not one of those, so I will watch movies in which he is the star without complaint. Alan Ladd was on the scene for many years before he got his big start as a headliner. 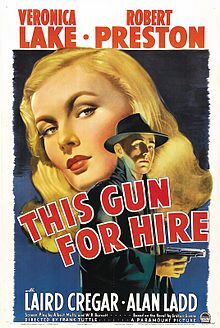 And this was news to me because I thought, pretty much, based on the impression that I got, that he just popped up out of nowhere to be cast as the star of This Gun for Hire. He had actually been a veteran as an extra on some 40 features and shorts since 1932. But the noir classic WAS his first starring role, and he never had to look back. A bit of history about Ladd; he was born in Arkansas. After his father died, his mother remarried, and eventually the three ended up in California, where Ladd was "discovered" while performing in a high school production of The Mikado. He was signed to a Hollywood contract, but was eventually let go. Not because his acting was sub-par, however; he was dismissed because he was "too short". He was only 5½' or so (height measurements vary) and leading men just weren't shorter than their leading ladies in those days. After various "working stiff" jobs, Ladd found work in radio, where his voice was the only factor, and his height didn't matter. His voice impressed an agent named Sue Carol who signed him and began promoting him, both for radio and film. He got several walk on roles over the next few years, but his height was still a hindrance. Then Paramount called. They were looking for the right person to play the role of a hitman in a production of Graham Greene's novel, A Gun for Sale, which eventually was titled This Gun for Hire. And not only was Ladd an excellent choice for the role, the added bonus was that Veronica Lake, the woman who would be the the leading lady, was shorter than Ladd. He never had to look back. His acting brought him the roles that exhibited his great acting, and on more than one occasion, studios even took to filming him on ramps and with special filming styles that de-emphasized his height. After a very brief career in the Army (he was initially classified as 4-F, but did serve for most of 1943 before he was discharged due to medical reasons), Ladd returned to Hollywood where he worked for another 20 years, until his death by accidental overdose in 1964. As stated before, the initial role that kicked off his career was as the hitman "Raven" in This Gun for Hire. It was followed by The Glass Key, both of which featured Veronica Lake as his leading lady. Raven goes to do the job for which he was hired, that of killing a blackmailer by the name of Albert Baker ( Frank Ferguson). (A side note: If you have ever seen the Steve Martin classic film noir parody Dead Men Don't Wear Plaid, you've seen the scenes where Alan Ladd appears and shoots his man, with Martin subbing for Ferguson in the scene). Raven then goes to meet the man who hired him, Willard Gates (Laird Creagar). Gates is a wimp, and somewhat of a weasel, with an affinity for peppermints. He pays off Raven, but unbeknownst to Raven, Gates has another agenda on his mind, that of getting rid of Raven as a confidante in his scheme, and he pays off Raven in bills that have been reported as part of a stolen payroll. Raven is tripped up in this regard when he uses one of the stolen bills to buy a dress to replace the one he ripped when he slapped around Annie. Enter Michael Crane (Robert Preston), a police detective on the trail of the stolen money. He shows up at the boarding house looking for Raven, but Raven escapes through a bit of subterfuge. Preston is the most annoying beau to ever come down the pike, if you ask me. He's a little too exuberant, which was OK when he played such roles as "Toddy" Todd in Victor/Victoria, but grated on my nerves in a film noir characterization. Raven, having discovered he has been duped by Gates, goes on the trail looking for him, and boards a train. On the same train is Ellen Graham (Veronica Lake), a nightclub singer who has recently been hired to sing in Gates' nightclub in LA. By coincidence, she has also been induced to spy on Gates for the government, because Gates is suspected of dealing with enemy agents, it being wartime that this movie takes place. They don't actually come down and name the enemy, but hints are it is the Japanese, which makes it even more treasonous in the eyes of the viewer at the time of this movie, since it had only been ½ a year or so since the bombing of Pearl Harbor. Gates telegraphs the police to meet the train, but Raven, with Ellen as his hostage, manages to escape the dragnet. A scene where Raven and Ellen are in a deserted building and Raven is about kill Ellen really shocks the senses, since up to that point we have been gradually, if somewhat reluctantly, dragged into a feeling of sympathy for the killer. 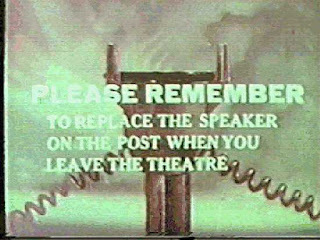 Fortunately for us, and the rest of the movie, Raven is interrupted by some workmen who are preparing to demolish the building. Needless to say, it all works out in the end, although maybe not entirely the way we as the viewers may hope at this point. 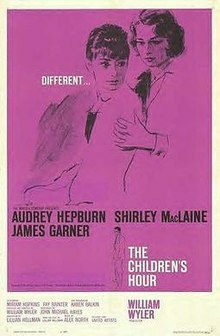 This is a really good movie, all the way up until the end. 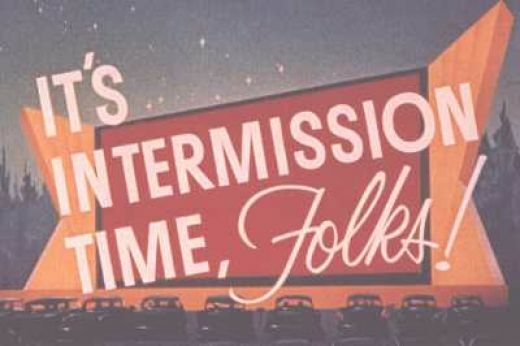 I can't understand, though, why a movie that involves all this subterfuge and killing ends, with the screen credits rolling, with a perky, happy almost screwball comedy type of music. It definitely seems like an odd choice. But that is the only downside to what is a terrific movie. Ladd is cast here as Ed Beaumont, a second-in-command to gangster Paul Madvig (Brian Donlevy) . Donlevy is the most unlikely looking gangster in the history of film, if you ask me, but be that as it may. Madvig is involved in trying to help a reform candidate, Ralph Henry (Moroni Olsen) to win the position of governor of the state, notwithstanding that Henry wants to shut down illegal operations of gangsters like himself, and his counterpart Nick Varna (Joseph Calleia). Varna is among those who have a stake in seeing that Henry does not win. And there is, of course, some animosity between Varna and Madvig, not just for the political reasons but because they are competitors in business. 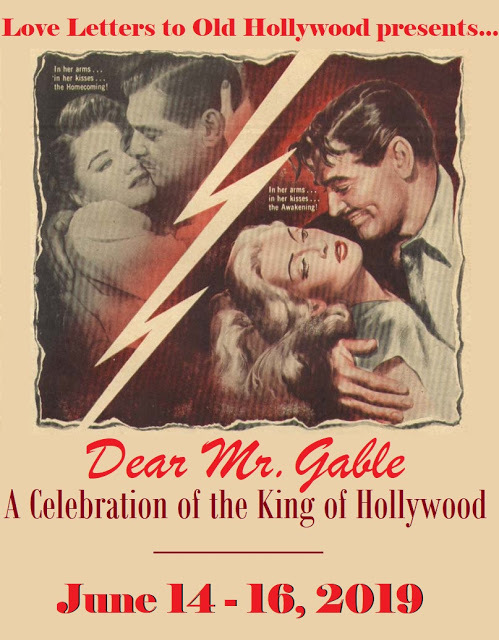 Madvig has a less than friendly encounter with Henry's daughter, Janet (Veronica Lake). She slaps him. Rather than be offended, Madvig proclaims he loves her and intends to marry her. (Must be a masochist, to boot). To complicate matters even further, Henry's son, Taylor (Richard Denning), is a gambler who owes big time money to Varna. And Opal (Bonita Granville), Madvig's sister, is carrying on a relationship with Taylor. A relationship that Madvig has attempted to discourage, but Opal is a girl with a mind of her own. But that is not going to be a problem for too much longer, because Taylor ends up murdered. And his body is found, first, by Ed. Which becomes a thorn in Ed's side, because someone is out to make an issue of that fact. A note starts popping up which states "If Paul Madvig didn't kill Taylor Henry, how did his best friend happen to find the body?" And everyone, it seems, suspects Madvig of having done it, including Ed. But Ed is still a loyal confidante and is determined to help Madvig through it, even though Madvig won't own up to the murder, or for that matter profess his innocence. But eventually, or so it seems, Ed gets fed up and quits his relationship with Madvig. And goes straight to Varna. Varna, for his part, is eager to have Madvig's right hand man in his camp, but apparentyly Ed is not so eager. Varna sicks his dog, Jeff (William Bendix) on Ed. Calling Jeff a "dog" is not meant to imply that Jeff (or Bendix) is ugly. It is meant to say that Jeff is as vicious as any pitbull stories you may have ever heard. In fact it is probably derogatory to pitbulls to call him a "dog"... Jeff beats the crap out of Ed. And seems to enjoy every minute of it. 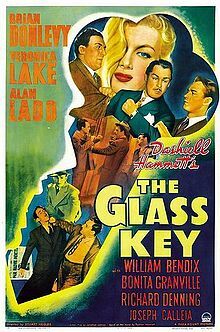 The Glass Key has it's downsides, not the least of which, as I stated, is the casting of Brian Donlevy as the most un-gangster-like gangster to ever be portrayed (on a film I've seen, at least. 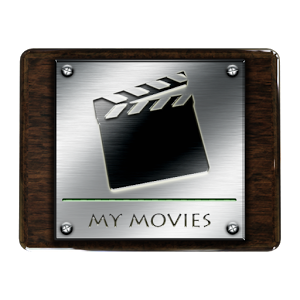 I don't include any overt comedies in that judgement, just gangster and film noir movies). The absolute best part of the movie, for me, is when Bonita Granville smiles with that twinkle in her eye. Makes me wish I had a time machine... If I had to pick only one of these two, I'd opt for The Glass Key just to see her. Well, time to pack the gat away and shuffle on home. Enjoy the movies. And Glass Key has some really great moments to make up for the nonsensical bits where we have to just go along with the plot because the writers said so. Ed's whole escape scene, for one -- just awesomely blocked and shot. Glad I finally got to read this! Yeah, I'm not a big fan of plot devices like the DEM either. I'm a little softer on coincidences just because I read a lot of old, old books, and Victorians in particular were really big on coincidences. "Oh, I just happened to collapse in a heap on the doorstep of people that turn out to be cousins I didn't know I had." In this day and age, we're firmly convinced that a coincidence in fiction should only serve to hurt or hinder the heroes, not help them, but it wasn't always thus. I think the only other thing I've seen Brian Donlevy in is Destry Rides Again, where he was more sinister, but still more cheery than you'd expect.